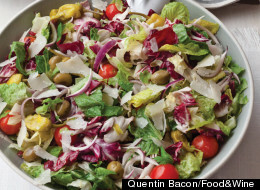 Part green salad, part antipasto salad, this recipe combines lettuce, celery, onion, peperoncini, olives, and cherry tomatoes—all tossed in a dressing made with olive oil, vinegar and a little mayonnaise. In a large bowl, mash the garlic to a paste with a generous pinch of salt. Whisk in the mayonnaise, vinegar and oregano, then whisk in the olive oil. Season with pepper. Add all of the remaining ingredients and toss well. Serve right away.